Published in Bird Observer, April 2004This report represents the Eighth Annual Report of the Massachusetts Avian Records Committee (MARC). Previous annual reports have noted the rather poor participation on the part of the local birding community in submitting written reports of rarities to the committee. This year, however, it is with considerable pleasure that the committee can report a notable improvement in this area. Nonetheless, reports of a number of species currently on the MARC’s Review List arrived lacking complete documentation, and the birding public is once again reminded of the importance of submitting full details for any species currently on the MARC Review List. For the fifth consecutive year the MARC reviewed reports of Pacific Loons and Selasphorus hummingbird species. Given the apparent increasing frequency of these species in Massachusetts, some might question why they continue to remain on the MARC’s Review List. In response to this, it is important to remember that the reporting criteria for species on the Review List include 1) any species recorded in Massachusetts fewer than 10 times overall or fewer than 5 times in the last 20 years, and 2) any rare and/or difficult to identify species as designated by the Committee. Pacific Loons continue to be difficult to identify and the species always has the potential to be confused with other loon species. Similarly, although most Selasphorus hummingbird species that have been captured and measured in Massachusetts have proven to be Rufous Hummingbirds, Allen’s Hummingbird has also been recorded in the state. With this in mind, carefully documenting all future Selasphorus reports continues to be important in an attempt to positively identity the species involved whenever they appear in the state, and also to accurately document what may be an important range extension for birds in this genus. And speaking of hummingbirds, a hummingbird visiting a feeder in Eastham was initially reported by the homeowner as a Ruby-throated Hummingbird; however, a group participating in the Cape Cod Christmas Bird Count visited the home and determined that it was instead a Calliope Hummingbird(Stellula calliope), a first Massachusetts record. The addition of this species brings the official state list to 477. “Richardson’s” Canada Goose (Branta canadensis hutchinsii), #02-46, December 3, 2002, N. Truro (Barnstable), A. Brissette* et al. The observers distinguished this individual from other races of Canada Geese, not only by its small size, but also by its different bill proportions, pale breast, and lack of an obviously broad white neck ring. The features exhibited by the bird effectively eliminated other small races (e.g., B. c. minima and B. c. leucopareia). Because of its current subspecific status, this form is probably underreported in Massachusetts, so it is difficult to determine how often it may actually occur in the Commonwealth. This small Canada Goose subspecies is currently being considered for full species status, so it is increasingly important to document sightings of this form for the future. Barnacle Goose (Branta leucopsis), #03-03, March 22, 2003, W. Bridgewater (Plymouth), J. Sweeney*. #03-04, April 13-14, 2003, Whately (Franklin), S. Smolen-Morton*. In the winters of 2001-2002, and 2002-2003 there were multiple reports of Barnacle Goose in Massachusetts. The first was in December 2001 in Gloucester, followed by one seen for several days in February 2002 in Wakefield. In 2003, single birds were reported from West Bridgewater on March 22; Turners Falls on March 25; and Whately on April 13-14. Whether these sightings represent multiple individuals or a single goose meandering about the state is a matter for speculation, although there is good reason to suspect that at least the Turners Falls individual was the same bird reported three weeks later just down the Connecticut River in Whately. While captive origin is always a possibility for reports of this species, these reports seem to fit into a pattern of sightings that suggest that vagrancy was the likely explanation. Pacific Loon (Gavia pacifica), #02-41, December 22, 2002, North Truro (Barnstable), V. Miller, M. Lynch*. The MARC approved an unambiguous description of a loon of this species, a species now reported annually in Massachusetts. Western Grebe (Aechmophorus occidentalis), #02-43, December 7, 2002, Plymouth Beach (Plymouth), J. Trimble*. The observer eliminated the similar (but far less likely) Clark’s Grebe by carefully noting a facial pattern showing no white in front or below the eye, and dark gray flanks with no white flecks. Northern Gannet (Morus bassanus), #02-40, December 4, 2002, Wayland (Middlesex), A. Weber*. Inland records for Northern Gannet in Massachusetts are extremely rare, but the description of this adult flying over Wayland was unequivocal. American White Pelican (Pelecanus erythrorhynchos), #03-08, June 28, 2003, Truro (Barnstable), J. Young*. The observer was watching a Turkey Vulture soaring over the Pamet marshes in Truro when he noticed a larger bird above the vulture which, even without binoculars, was obvious as an American White Pelican. It circled overhead for 15 minutes before veering off to the southeast. Anhinga (Anhinga anhinga), #01-24, June 17, 2001, Essex (Essex), T. Young*. The first Anhinga ever reported in Massachusetts was in 1981. Since then three reports have been accepted by the MARC, one of them in Avon, only two days after this sighting, and possibly representing the same individual (MARC Sixth Annual Report, #01-06). This bird was seen in a flock of Double-crested Cormorants, allowing a direct side-by-side comparison. White-faced Ibis (Plegadis chihi), #03-11, July 8-15, 2003, Rowley (Essex), R. Heil* et al. An ibis that was discovered among a flock of Glossy Ibises in a salt pan off Route 1A in Rowley was determined to be an adult White-faced Ibis. The observer carefully noted the critical differences between the White-faced Ibis and nearby Glossy Ibises, specifically its larger size, bright red eye, reddish legs, reddish bare skin on the face from eye to chin and, of course, the extensive white feathering around the face. There are less than six records of this species for Massachusetts. Wood Stork (Mycteria americana), #03-13, August 24-25, 2003, Barre (Worcester), S. Huntington, C. Buelow*† M. Lynch*. #03-12, April 20, 2003, Lowell (Middlesex), J. Amaro*. Four immature Wood Storks flew into a small farm pond in Barre on August 24, where they were reported to a local birder by the landowner. A follow up the next day resulted in the discovery of the continued presence of three birds, which was documented by both field notes and photographs. Later in the day the three birds left the pond to forage in an adjacent field, where ultimately the resident cows flushed the storks into a swampy area nearby, from which they eventually disappeared. A ranger for the Lowell National Historic Park spotted a single Wood Stork in Lowell foraging among trash in a local canal. Despite the observer’s lack of experience, and the date being two months earlier than any previous record for the state, the details accompanying this report were sufficiently convincing for the Committee to accept it. Red-necked Stint (Calidris ruficollis), #03-14, July 8-9, 2003, Chatham (SB) (Barnstable), B. Nikula. #03-15, August 14-19, 2003, North Monomoy (Barnstable), B. Nikula*, C. Marantz*. The first record of this species in Massachusetts was in 1980 when two separate individuals were reported. The next sighting was not until 1998, from which time on the species has been reported almost annually. The two reports in 2003 were seen and photographed a month apart. The first was in alternate plumage on South Beach in Chatham, while the second was a bird in faded alternate plumage on North Monomoy Island. Shorebirds regularly move between these two nearby locations, so the observer considered the possibility that the sightings could have pertained to the same individual; however, careful examination of photographs showed distinct differences in plumage, proving that different birds were involved. Mew Gull (Larus canus), #03-02, March 8-10, 2003, Newburyport (Essex), J. Berry*, P. Baicich et al. 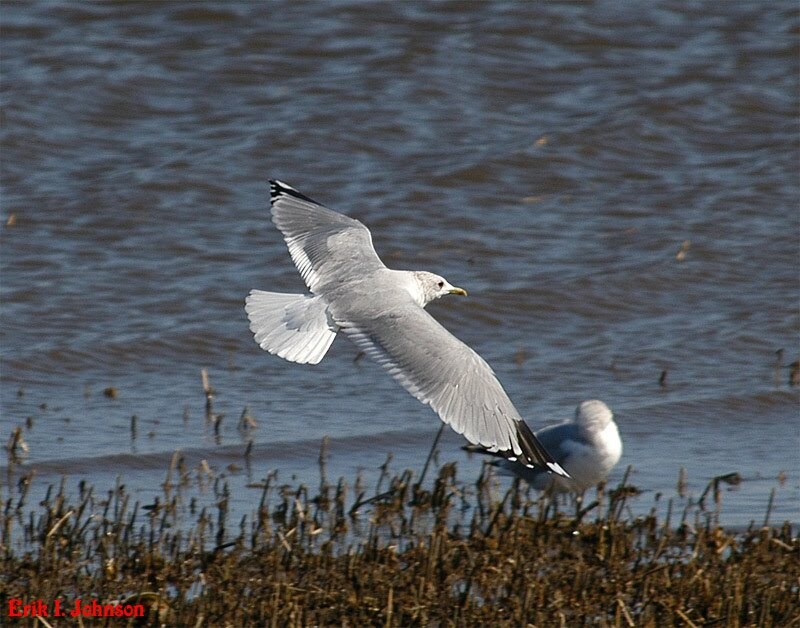 An adult Mew Gull of the European subspecies (i.e., Common Gull) (L.c. canus) was discovered among a flock of Ring-billed Gulls at the edge of the Merrimac River. The observers were able to view the bird at a distance of less than 50 feet for nearly an hour and a half. A clear description combined with excellent photographs left no question of the bird’s identity. L. c. canus is apparently the subspecies most often recorded in Massachusetts, although there are also two known occurrences of the western United States subspecies, L. c. brachyrychus. Calliope Hummingbird (Stellula calliope), #02-39, November 1-December 19, 2002, Eastham (Barnstable), A. Fuller, J. Kricher*, R. Heil*, Trimble†, Nikula†, et al. This remarkable bird came to light when a group taking part in the Cape Cod Christmas Bird Count followed up a previously reported Ruby-throated Hummingbird visiting a feeder in Eastham. The group spent some time studying the alleged Ruby-throat, noting its small size and primary projection beyond the bird’s short tail. These features, along with several colored feathers in the bird’s gorget, eliminated both Selasphorus andArchilochus species. Eventually it was determined that the bird was an immature male Calliope Hummingbird, and subsequent high quality photographs confirmed this identification. Calliope Hummingbirds have been appearing in the southeastern United States with increasing frequency. There is one record for New Jersey, and as recently as 2001, two were discovered in New York City. This first state record for Massachusetts fits into an increasing pattern of vagrancy for this species. Rufous Hummingbird (Selasphorus rufus), #03-22, September 18-October 24, 2003, Newbury (Essex), S. Stichter*†. In the fall of 2002, a Newbury backyard hosted two Selaslphorus hummingbirds. In 2003 another showed up that was netted and identified as a hatch-year male Rufous Hummingbird. This extraordinary series of records at a single location underscores the increasing frequency with which this species is occurring in Massachusetts. In the fall of 2003, no fewer than six Selaslphorus hummingbirds were reported, three of which were identifiable as Rufous Hummingbirds, either by measurements and banding or by distinct plumage characteristics. Selasphorus Species, #03-23, October 12,-27, 2003, Lanesboro (Berkshire), P. Dion; S. Stichter*, P. Brown.† A bird visiting a feeder was photographed and described, clearly indicating Selasphorus. Hammond’s Flycatcher (Empidonax hammondii), #03-25, November 1, 2003, Tuckernuck I. (Nantucket), R. R. Veit*. The observer was first attracted to a Zonotrichia-like call note which he ultimately traced to an Empidonax flycatcher that possessed a bold, almond-shaped eye ring. Having had extensive previous experience with Hammond’s Flycatcher, he quickly realized the call note was that of a Hammond’s Flycatcher. Committee members commented on the difficulty of identifying fall Empidonax, but all agreed that the careful description of plumage and call note eliminated all other possibilities. This is only the second record of Hammond’s Flycatcher in Massachusetts, the first being an individual that was banded and videotaped in Wellesley in December 1988. Say’s Phoebe (Sayornis saya), #02-42, November 6, 2002, Pittsfield (Berkshire), R. Ferren* et al. #03-18, May 18, 2003, Bedford (Middlesex), D. Ranney, F. Gardner*†, A. Strauss*. Both of the Say’s Phoebes here reported were seen for one day only, not unlike other records of this species in Massachusetts. The Pittsfield bird was spotted briefly from an office window, after which the observer rushed outside to confirm his initial impression that it was a Say’s Phoebe. Fortunately he was able to alert local birders, who were eventually able to watch it flycatching around the building before it disappeared early in the afternoon. The Bedford bird was only the second spring record for this species when it was discovered flycatching from a fence in a horse pasture. Word quickly spread and it was later seen and photographed by a number of birders. MacGillivray’s Warbler (Oporornis tolmiei), #03-27, November 1-3, 2003, Bradford (Essex), S. Carlson* + D. Larson*†. An elusive Opororniswarbler discovered in the yard of two lucky birders in Bradford eventually revealed its thick white eye crescents, whitish throat, and short undertail coverts, confirming its identity as a MacGillivray’s Warbler. The bird vocalized frequently, producing a distinct note described as similar to that of a Common Yellowthroat, only louder and more emphatic. The bird was eventually photographed and seen by numerous other experienced birders. There have been fewer than ten previous records of this species in Massachusetts, five of which occurred between 1996 and 1999. Spotted Towhee (Pipilo maculatus), #99-25, January 1-February 23, 1999, North Hadley (Hampshire), S. Surner, S. Smolen-Morton*. This report represented the first occurrence of this species since the “Rufous-sided” Towhee was split into Spotted and Eastern Towhee (P. erythrophthalmus). Despite its long stay at the same location, its skulking and elusive behavior frustrated many birders who waited many hours in the cold to see it. Lark Bunting (Calamospiza melanocorys), #00-27, April 25-May 4, 2000, North Truro (Barnstable), S. Smolen-Morton*. #00-28, November 21, 2000, Hadley (Hampshire), P. Yeskie†. #02-47, September 2, 2002, Edgartown (Dukes), A. Keith*. Most records of Lark Buntings in Massachusetts have occurred in the fall, but the North Truro male was a rare exception, spending over a week at a feeder. The Hadley bird was a female, also present and photographed at a feeder. The date of the bird in Hadley was more typical for this species, however since most sightings of Lark Bunting are near the coast, its occurrence in the Connecticut River Valley was noteworthy. The female seen at Edgartown fit nicely into the more usual pattern for Lark Bunting occurrences. Henslow’s Sparrow (Ammodramus henslowii), #03-21, October 5, 2003, Bolton Flats (Worcester), M. Lynch*. This bird was discovered by the leader of a field trip, but before the bird could be shown to the group, it dove into the weeds and eluded rediscovery. The skulking nature of this sparrow makes this kind of experience typical. Henslow’s Sparrows are very rare in Massachusetts these days, with only four records in the past ten years. In 1994, a pair was discovered breeding in Lincoln with a successful outcome, the first such attempted nesting in over a decade. Harris’s Sparrow (Zonotrichia querula), #98-31, November 11-18, 1998, Plum Island (Essex), P. Drew, S. Smolen-Morton*. A first-winter bird spent a week feeding near the Hellcat Marsh at Parker River Wildlife Sanctuary. Birders reported attempting to observe it at a cautious distance, but the bird was so tame it would approach people, and in several cases, actually walked over their shoes. “Gambell’s” White-crowned Sparrow (Zonotrichia leucophrys gambelii), #02-38, “Late May,” 2002, Plum Island (Essex), D. Tambesco, R. Heil*. The gambelii subspecies of the White-crowned Sparrow is reported occasionally in the fall, and is probably underreported, since many birders do not examine White-crowns carefully. Evidence of this sighting did not turn up until several months later when the observer showed a photograph to a friend whom instantly recognized it as gambelii. This is the first spring record of “Gambell’s” White-crowned Sparrow in Massachusetts. Bullock’s Oriole (Icterus bullockii), #98-30, March 1-15, 1998, Reading (Middlesex), D. Scromm, S. Smolen-Morton details*. An adult male spent two weeks visiting a feeder in Reading, where it was photographed and seen by dozens of birders. For a report to be accepted by the MARC, it must receive a minimum of eight votes out of nine. If the first ballot receives a majority of “yes” votes, but less than the eight required minimum, the ballot is recirculated to the Committee along with Member comments. After the second round of balloting, if there is still a majority “yes” votes, but a failure to receive the eight required votes to accept the report, the ballot is discussed at the next meeting of the committee before a third and final ballot is cast. For this reason some of the reports that follow may show a majority of “yes” votes after a third ballot. † Photographs submitted, or obtained on the internet. The Massachusetts Avian Records Committee (MARC) was formed to evaluate reports of rare and difficult-to-identify species, as designated on its Review List. For more information about the MARC, or to see copies of previous MARC reports, see <http://Massbird.org/MARC/>. MARC members include Steven Arena, James Baird, Davis Finch, Rick Heil, Blair Nikula, Scott Surner, Jeremiah Trimble, Richard Veit, and Wayne Petersen (Chair). Marjorie Rines is the Secretary. The author thanks Wayne Petersen and Blair Nikula for editing assistance.